The avalanche of e-mails from New York Times Cooking usually gets deleted immediately, but this one caught my eye: “24 Kid-Friendly Dishes That Can Really, Truly Be Ready in 30 Minutes or Less,” the subject line read. This is relevant to my interests, I thought, momentarily forgetting that these are the same people who told us to make guacamole out of peas, bless their hearts. If the headline hadn’t read the same as the e-mail subject line, I would have been sure the link had mistakenly re-directed to another collection, because what I found was a group of recipes that apparently were curated by someone who has never met an actual child. I have taken the liberty of updating a few of these “kid-friendly” dishes to make them more palatable for the little ones and more plausible for working parents to prepare on a weeknight. • NYT: This elegant riff on a childhood favorite came to The Times in 2009 by way of Jamie Oliver, the British chef and cookbook author. It’s wholesome (no powdered cheese! ), and it can be ready in about 15 minutes. • Dad Life Tips: Whip up a box of shells and cheese (no powdered cheese! ), and mix in a bag of “real” bacon pieces and some frozen peas for a balanced meal with four food groups! • NYT: This easy weeknight recipe is pasta the way it is meant to be, and it can be prepared with items already in your pantry or easily procured at your farmers’ market, corner deli or backyard garden. Fresh mint, sage, rosemary and parsley are tossed with chopped ripe tomatoes and tossed with sizzling hot olive oil. • Dad Life Tips: Since you didn’t have time to swing by the farmers’ market or corner deli and your backyard garden didn’t take this year, boil some pasta and toss with butter and parmesan. Season with items already in your pantry, such as salt and pepper. • NYT: Traditionally, the term “meunière” refers to fillets of sole that are floured and sautéed quickly, then finished with lemon juice, parsley and browned butter. But there’s no reason to be parochial about it. This is a fast, surprisingly elegant approach to boneless, skinless chicken breasts, or cutlets of pork, turkey or veal. • Dad Life Tips: Chicken nuggets aren’t naturally shaped like dinosaurs, but your kids are more likely to eat them if they are, so there’s no need to be parochial about it. And they’re ready in three minutes. • NYT: For a fresh and bright variation on your morning eggs, try strapatsatha, a simple Greek dish of scrambled eggs with tomatoes. It’s as simple as can be: The best, freshest tomatoes you can find are grated on a box grater and reduced a bit, then scrambled with eggs, a little olive oil and garlic. A handful of tangy feta crumbles finishes it off. • Dad Life Tips: The tardy bell rings at 7:45 a.m. Just make scrambled eggs and start yelling for people to get their shoes on. • NYT: Made with a simplified, scallion-laden batter, it is a fork-tender pancake reminiscent of a vegetable fritter. The same formula can be used to make pancakes with other members of the onion family, especially shallots and spring onions. • Dad Life Tips: Kids love pancakes! Kids love onions! Oh wait, no they don’t. Stick to plain, blueberry, or on special occasions, chocolate chip. • NYT: The two things I love most about this dish of summer vegetables and pasta are the crunch of the corn against the tenderness of the pasta and the fact that I cannot seem to settle on a combination of flavorings that I think is best. Chile powder, a little bit of cayenne, perhaps some cilantro are all excellent choices. But with pasta this seems too heretical even for a culinary atheist like me, so I usually go in a tamer direction: a suspicion of garlic with some fresh tarragon or basil. 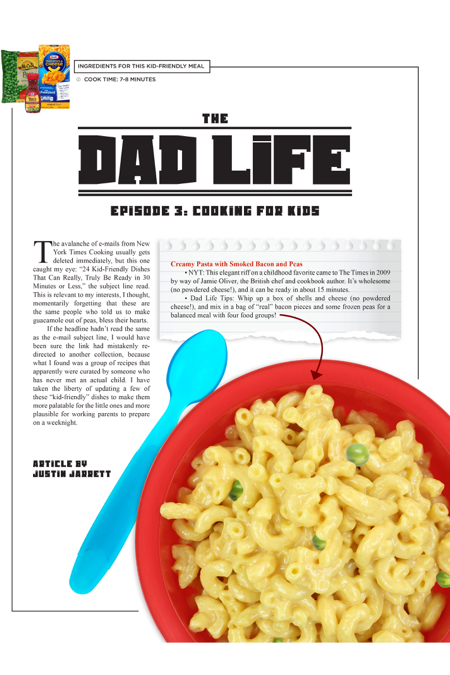 • Dad Life Tips: The two things your kids will love most about this are the pasta and the corn. The thing you will hate about it is listening to them whine while they pick out all the zucchini and tomatoes and “green stuff,” regardless of what seasonings you opt to use. • NYT: Mushrooms make a meaty quesadilla filling. If you cook them in advance and keep them in the refrigerator, you can slap these together in a pinch. • Dad Life Tips: You know what else makes a meaty quesadilla filling? Meat. And it’s not mushrooms, so your kids might eat it. • NYT: In southern Italy, this dish has the evocative name Uova al Purgatorio. When I make tomato sauce in the summer, I freeze it in half-cup portions, which makes this meal for one easy to throw together. • Dad Life Tips: Wait, why is a “meal for one” listed in the “kid-friendly” collection? And if you’re making homemade tomato sauce in the summer, why are you reading this column? • NYT: These quesadillas have little in common with fast-food varieties, which are made with flour tortillas and a lot more cheese. • Dad Life Tips: Another area where the two varieties differ; kids won’t eat these. Quesadillas are literally the easiest kid-friendly meal on the planet, but the NYT has managed to find two different ways to mess them up. • NYT: There’s nothing wrong with a dinner of pan-seared chicken seasoned with salt and pepper. But there’s everything right about the same chicken when you add anchovies, capers, garlic and plenty of lemon to the pan. • Dad Life Tips: You had me at the first sentence. You lost me with the anchovies. • NYT: Like all fried-rice dishes this begins with leftover rice (freshly cooked rice is too moist to fry well). It’s jasmine rice here, but white from Chinese takeout works nearly as well and is more convenient. Perhaps unsurprisingly—this is a chef’s recipe, after all—separate cooking processes are called for: ginger and garlic are crisped, leeks softened, rice and eggs fried. But no step takes more than a few minutes, and the results are absolutely worth the effort. • Dad Life Tips: Sorry, I only made it to “Chinese takeout,” and it will be ready in about 15 minutes, so I’ve gotta run.